How many ways can we cook asparagus? Another favourite from the River Café where the prosciutto gives a big addition to the flavour. 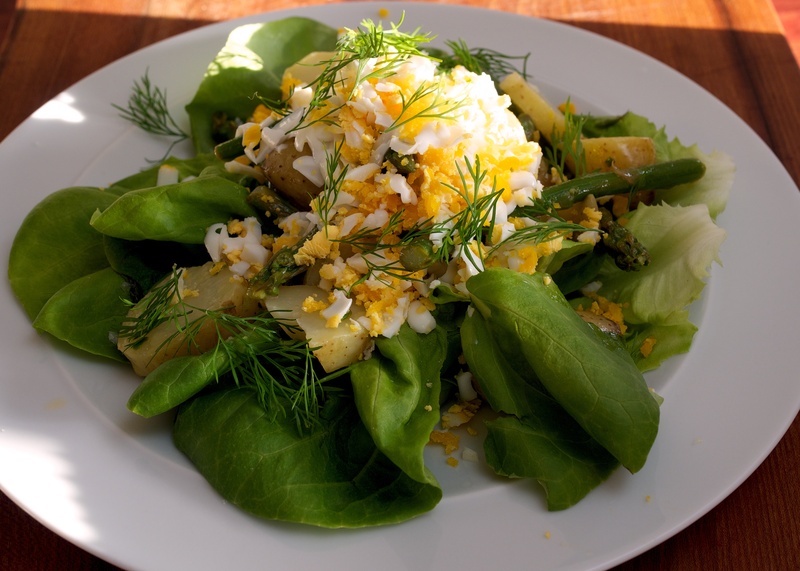 Serve with a few asparagus tips and top quality olive oil on top. Delicious! Wine suggestion: Sauvignon Blanc with bags of flavour. Something like the Dog Point from New Zealand or the Dezat Sancerre from the Loire will work great. Going slightly off-piste we love the Domaine Bellier Cheverny Blanc which combines 85% Sauvignon Blanc with Chardonnay in a un-sung appellation from the Loire, a really good food wine. Snap the woody ends off the asparagus and cut the remaining stalks into short lengths. Keep the tips to one side. Heat 2 tbsp of oil in a heavy-based pan, add the onion and soften for 5 minutes, then add the prosciutto, potatoes, parsley and asparagus stalks. 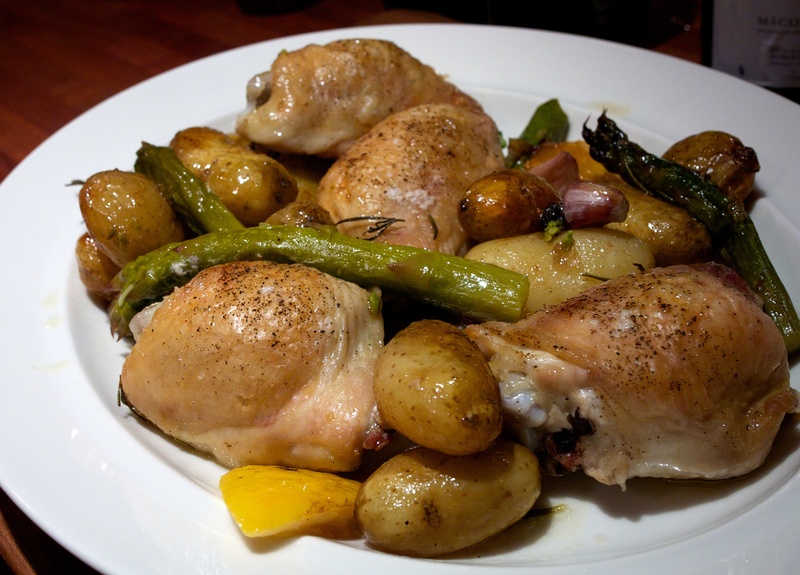 Season with pepper (hold off on the salt until the end as the ham is salty) and cook for 5 minutes, stirring, then add the bouillon and simmer until the potatoes and asparagus are tender – about 15 minutes. Add the spinach and most of the asparagus tips and cook for a another few minutes. Remove from the heat and blend to a rough purée. Heat 3 tbsp of olive oil and fry the reserved tips for a few seconds. Serve the soup with the asparagus and oil drizzled over each bowl. This was tasty. We were a bit concerned about the boiled onion at first but it gives a nice onion flavour without any fried taste which isn’t required here with the light creamy sauce. Good for a weeknight or weekend lunch. Put the pepper halves under a hot grill, skin side up, for around 10 minutes or until the skin is completely charred. Seal in a plastic bag and leave to cool, then peel and discard the skin. Slice the flesh into large pieces. Cook the chopped onion in a pan of salted boiling water for 9 minutes, then add the asparagus. Cook for another minute before adding the sugarsnaps and continue to boil for another 2 minutes. Drain and rinse in cold water. Cook the penne in a large pan of salted boiling water for the recommended time on the pack, then return to the pan with the cooled vegetables. Add the roasted pepper, cream and cheese and stir over a gentle heat to warm through. Season well with sea salt and black pepper. 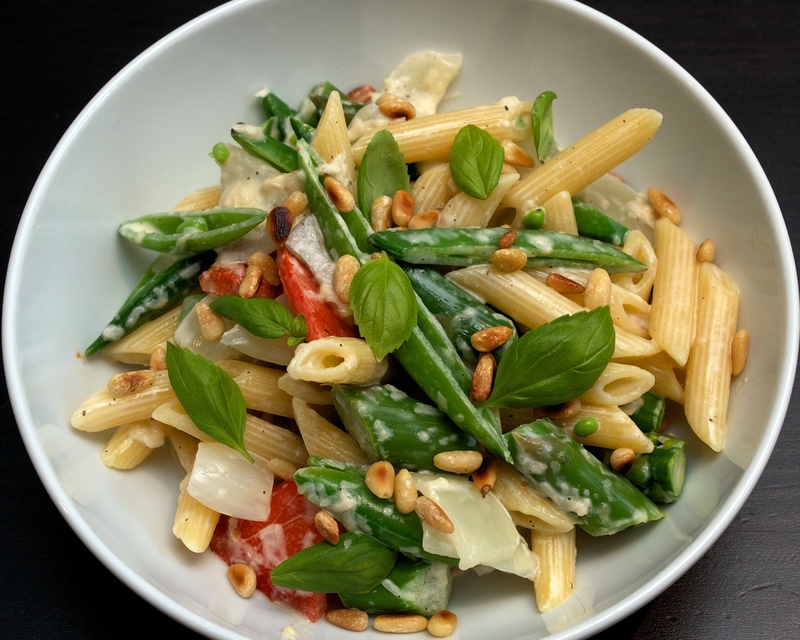 Squeeze over the lemon and scatter over the pine nuts and basil to serve.